I’m letting this time between Christmas and New Years be mostly a time to rest. Since I’m having a hard time getting geared up to put my goals and calendar in order for 2016, it must be that I need this. Today, I did go to the gym and finished this little wash cloth, which I love because it is soft and squishy. I also used some time to talk to the Vitamix people. The first one we had for 18 years before I burned out the motor. This one we have had 6 months. So they are paying shipping both ways and repairing it, which is nice. It’s just hard living without it, since we use it at least once daily and often multiple times.. I’m also sending the “18 year” one to them. They have agreed to repair that for a small fee so that when one has problems in the future, we will have a back up. Fun washcloth! What’s the pattern? If you join the yahoo group Monthly Dishcloth group, you can access their files. 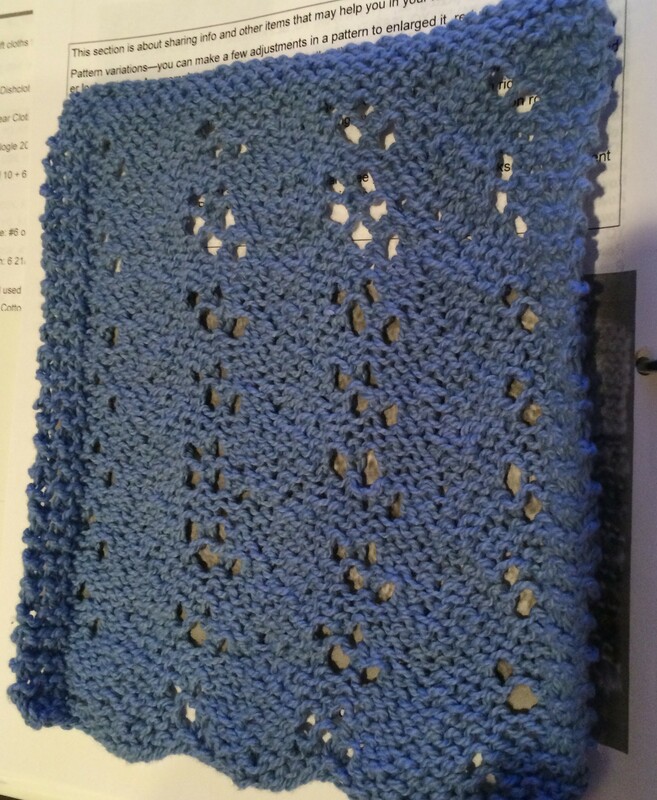 This is near the back in their 2015 Knitting calendar “year of the sheep” It is near the back and called Weekend blues cloth?